Congratulations! The parish community and the staff joyfully welcome you and your family at this special time. The Baptism of your child is a wonderful event both in the life of your family and for our parish community. Through the Sacrament of Baptism, your child will receive the life of Christ and become a member of the Roman Catholic Church. We are happy to be part of this important event and assist you as you bring your child to the waters of Baptism. To have your child baptized at Saint Clement Parish, we ask that you follow these guidelines and use them as a handy checklist in preparation for the celebration of the Sacrament. Contact the parish secretary during rectory business hours at (216) 226-5116 to inform the parish of your request and to begin the information Baptismal form. All requests will need to be approved by the pastor. The pastor may invite you to meet with him prior to setting the date of Baptism. The pastor must approve the date and Baptismal request. Then either the pastor, deacon, or parish secretary will gather the pertinent parish information (names, date of birth, etc.) for our permanent parish records. Baptisms can be celebrated after or during mass. Other Baptismal times need to have a good reason and approval by the pastor. Because your child is being baptized into the community of the Church, there may be more than one child being baptized at that particular time, but all infants and families are treated individually during the rite. Make sure that you are currently registered members of our parish. If not, the parish secretary can help you fill out a registration form for your family prior to the day of Baptism. If you are not registered here at Saint Clement already, there may be a required waiting period of six (6) months to Baptize your child. If you are able to obtain a letter from your previous parish stating that you attend Mass regularly, this waiting period will be waived. Both parents should have participated in the Baptismal preparation program either at Saint Clement or at another parish. Proof of attendance is required for only your first child. Parents should choose godparents (also known as sponsors) for their child’s Baptism. Before asking someone to be a godparent for Baptism, we strongly advise you to read over and understand fully the Catholic Church’s requirements for someone to assume the role of godparent for your child. In this way, you will save time and possible embarrassment. The role of godparents is extremely important in the eyes of the Church. Because of this, the Church has clear and definite regulations regarding the selection of godparents for the Sacrament of Baptism that go beyond questions of family relations or culture. Godparents must be practicing Catholics. This means that they have to be baptized Catholic and are at least 16 years of age. They must have received the Sacraments of Penance, Confirmation, and First Eucharist. They must currently be leading lives in harmony with the Catholic faith and teaching. They must be registered in a parish, participate in Mass weekly, and receive the Sacraments regularly. If married, their marriage must be one recognized as valid by the Catholic Church. At least one week before the Baptism, each godparent should present a Sponsor Certificate from a priest at his/her parish. Each godparent must contact his/her parish to obtain such certification. Under Church law, only one godparent is required; no more than two are permitted as official sponsors. Thus, it is customary for parents to choose both a godmother and a godfather. This means that it is not permissible to have two godmothers or two godfathers. In certain instances, instead of a second Catholic godparent, a baptized and practicing Christian of certain other Christian communities may stand up for the child as a Christian Witness. Those acting as Christian Witnesses are asked to show proof of baptism and that they are practicing in a Christian community. A simple statement from their pastor is all that is required. 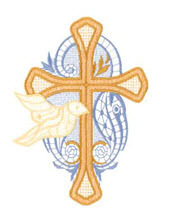 Due to the complexity of Church law regarding the requirements for being a Christian Witness, please check with the parish before asking a non-Catholic to be a Christian Witness. Again, we wish to save you any unnecessary difficulties. Only one Christian witness is allowed; one sponsor must be a practicing Catholic. A fallen-away, inactive, or unconfirmed Catholic may not serve as a Christian Witness. Please remember that people of faith whose religion does not include Baptism (e.g. Judaism, Islam, Buddhism, Hinduism) are ineligible to sponsor someone for a Sacrament they have not themselves received and in a faith they themselves do not share. Although welcome to attend your child’s Baptism, they cannot act as godparents or sponsors or as a Christian Witness. In addition, a person who was a Catholic and has given up their faith to join another religion may not act as sponsor or Christian Witness. Likewise, the mother or father of the one to be Baptized cannot act as sponsor or Christian Witness. These Church rules and guidelines for godparents are not meant to be judgmental. They simply follow in a common sense manner the fact that godparents are representatives of the Catholic community, and not merely honorary or family roles. In addition to a Roman Catholic godparent, the other godparent may be of Eastern Catholic or Orthodox Church. Again, this godparent must be registered in their home parish, attend Divine Liturgy weekly, be married in the Roman Catholic, Eastern Catholic, or Orthodox Church, and obtain a sponsor certificate from their parish. In some circumstances, a chosen godparent may not be physically able to attend the Baptismal ceremony (e.g., due to military service). In such cases, please talk to the priest about the role of proxy. The preeminent day for Baptism is the Lord’s Day, Sunday. Given the constraints of time, distance, and family schedules, we normally offer Baptisms each week in Church during or after Mass. There are some exceptions, e.g. High Holy Day, major parish activities. Please check with the parish secretary about dates and times. Again, because Baptism is a community event, not simply a private family ritual, there may be more than one Baptism scheduled at a time. We encourage as many family members to attend as possible and realize what a joyous occasion this is. We welcome everyone. However, we ask that all attending in the ceremony participate fully and help make this joyous event and sacramental celebration one that is both holy and prayerful. There will be ample time and opportunity for taking appropriate photographs and video. 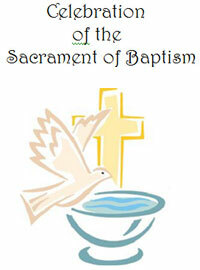 The celebrants of the sacrament of Baptism are the parish priest and deacon, who are assigned on a rotating schedule. If you would like a priest or deacon in your family, or one who is a family friend, or a particular priest or deacon of our parish to Baptize your child, we are happy to welcome him. However, please let us know well in advance when you call in your information to the parish office. A Baptism with a visiting priest or deacon may be scheduled at a special time. Even when a priest-friend or relative or deacon-friend or relative officiates at the ceremony, parents must still make all arrangements through the parish office and follow all the guidelines noted above. Many people ask about making an offering a honorarium at Baptism. It is customary for the parents/family to make a monetary offering to the priest or deacon at the end of the baptismal ceremony. Such offerings are traditionally part of a priest’s salary and the manner in which he makes his living. To be considerate for all involved, please be on time for the Baptism. We realize that caring for young infants is not an easy job and children can become sick overnight. If your baby is sick and you cannot make the day for Baptism, please call us and let us know so that we and the other families are not waiting for you. We deeply appreciate your thoughtfulness in this regard. Once the ceremony is completed, your child’s Baptism will be recorded in the permanent records of Saint Clement Parish. You will receive or be mailed a copy of that record (a Baptismal certificate) after the Baptism. Again, we thank you for taking time to read these instructions and welcome you to the celebration of Baptism. Please, click here for additional information on Resources’ Links page.